Is ATC connected to the Internet & why? I've just read an article from SkyNews just here where they said it's expected that one day air traffic control will be the target of cyber attacks. So my question is "Is ATC connected to the Internet and why ?" Are they just connected (if they are) to exchange information between the various ATC Centers and in this case I think they use VPN connections with military grade encryption or do they use Internet for other reasons ? ..Federal Aviation Administration (FAA) has increasingly turned toward the use of commercial software and Internet Protocol (IP) -based technologies to modernize ATC systems. NextGen is a modernization effort begun in 2004 by FAA to transform the nation’s ground-based ATC system into a system that uses satellite- based navigation and other advanced technology. ... These new technologies will use an Internet Protocol (IP) based network to communicate. ... the shift to NextGen technologies will require FAA to replace its proprietary, relatively isolated ATC computer systems with information systems that interoperate and share data throughout FAA’s operations and those of its aviation partners. ... These new systems...will also employ digital and Internet-based computer-networking technologies, exposing the air traffic control (ATC) system to new cybersecurity risks. We ... are now working all over the world within an industry where systems are connected across organisations, countries and continents. Such an interconnected worldwide system requires a standard platform, which will not be possible (or atleast very difficult to maintain) if a closed, proprietary platform is used. So, the ATC does use internet, though this is mainly to transmit information. However, I'm not aware of the security systems, though we can be sure that they do have some sort of encryption (If I'm correct, Lockheed Martin supplies the software) and have firewalls to protect the systems. You'd be surprised what's connected to the internet. I've been an information security consultant for more than a decade and every time I think I've seen it all I see new levels of foolishness. I would not expect ATC systems to be directly accessible from the internet as that's a very bad idea, but I would not be surprised if it came to light that someone had been dumb enough to do it. However, you don't have to have systems directly connected to the internet for them to be vulnerable to attack, in fact they don't have to be connected at all. Attackers go after protected targets by gaining a foothold on internet connected systems and using them as jumping off points to other systems. An attacker could be a single person, a small group, or a large, state-sponsored hacking organization. A very common scenario is that an attacker infects users' personal computers by sending them malware (a virus, trojan horse, worm, etc) in an email, or emailing links to websites which have been compromised. The malware infects a user's computer using vulnerabilities in the operating system or installed applications and allows the attacker to access that computer in a way that the user cannot detect. Once the attacker owns the user's PC he/she can then sniff around the network and compromise other systems, again using vulnerabilities in operating systems and/or applications. In the case of ATC an attacker could, with the right expertise and resources, penetrate and map out critical ATC computer infrastructure to the point where it could be widely disrupted. I am not personally an authority on this subject, but I can point to some information the FAA has released. System Wide Information Management (SWIM) is the network structure that will carry NextGen digital information. SWIM will enable cost-effective, real-time data exchange and sharing among users of the National Airspace System. 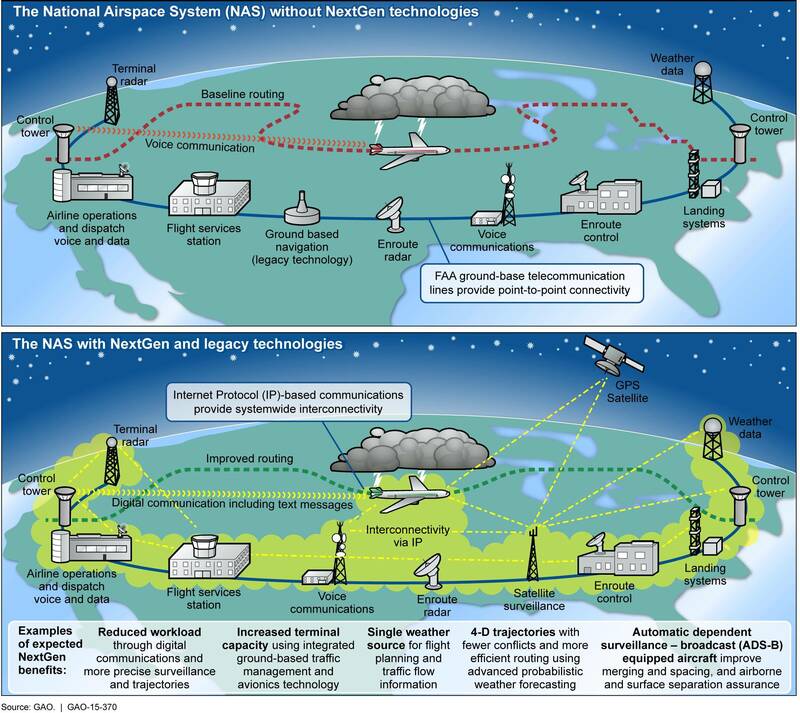 NextGen is the ongoing modernization of the US National Airspace System, so this describes the current plan. Note that controllers are one user group of the National Airspace System. Security controls are defined in FAA Order 1370.114 - "Implementation of FAA Telecommunications Infrastructure Services and IS Requirements in the NAS". This document is not public. provides guidance to external system owners for provisioning IP-based service connectivity to a National Airspace System (NAS) system. WMSCR (Weather Message Switching Center Replacement System): Collects, processes, stores, and disseminates textual aviation weather products and NOTAM information. WARP (Weather and Radar Processor): An enroute weather system that provides Mosaiced Next Generation Weather Radar (NEXRAD) information to air traffic controllers via the Display System Replacement (DSR) and provides meteorological products to the Center Weather Service Unit (CWSU) meteorologists and Traffic Management Specialists (TMU). So it depends on what you consider "ATC". These are critical systems that support controllers and others. They are 'connected to the internet', albeit through many layers. It is the FAA's intent to terminate point to point (local) connections between FAA NAS systems and outside entities as soon as possible and to replace them with connections made via secure gateway. ...implying that there are (or were) (more) direct connections into certain FAA networks, which are being overhauled with the plan described above. There are many aspects of ATC. One would speculate that systems such as primary and secondary radar are appropriately sand-boxed internally. But clearly certain systems are in some fashion exposed to the internet, at least to expose data for use by others. ATC mostly rely on so-called operational network not directly connected to internet. As mentionned by aeroalias there are links between operational and business networks that might be vulnerable. There is also a growing trend to interconnect systems to improve throughput, thus increasing exposure. 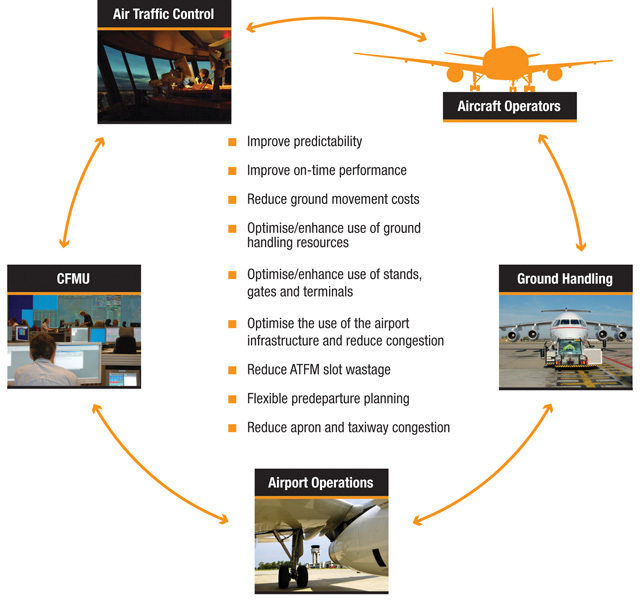 Below is a scheme illustrating collaborative decision making on an airport. Last but not least, ATC rely on wireless communication between control and planes, which is vulnerable to listening and spoofing. Not internet-based, but yet vulnerable to cyber-attack. Not the answer you're looking for? Browse other questions tagged air-traffic-control security or ask your own question. How can I politely remind ATC that I'm waiting for instructions or clearance? How does ATC protect Air Force One? How can civil ATC maintain safety with military aircraft around? To what extent is the HOST system still in use? Why can’t air traffic control radars determine the altitudes of primary targets?